I am so happy that summer is here. BBQing, macaroni and potato salad, and pies all seem to go hand in hand with it right? Well allergies seem to be going hand and hand with it for me this year too! I have had some trouble in the past with them, but nothing compared to this year! Sneezing, itchy/watery eyes, headaches, and that general feeling of cotton in your head has not been very conducive to make good food, taking good photos, and posting something that doesn't sound like I am just babbling (although I think some of my posts do sound like that from time to time with no allergies to blame them on). I saw this pie originally on Bunny's Warm Oven. As many of you know, I am not a baker. I do it around the holidays and that is about it. But I have been wanting to try it more and more. Her Creamy Blueberry Pie screamed MAKE ME MAKE ME at me. Maybe that was the fog of my allergies making me think it was screaming at me but my taste buds, plus many of my Facebook followers wanted me to make it ASAP! Kevin is not much of a dessert guy, and with the kids all living away now I knew I needed to entice him to eat this pie. Blueberry is not one of his favorites. Oh he has eaten them and liked them. For example, when I made my Blueberry Pancakes with Greek Yogurt and Lemon he came back for seconds. But his favorite berry hands down is blackberries. So blackberry it was going to be. I stayed pretty true to the recipe, just a few tweaks. I was so nervous while it was baking. It smelled soooo good but would it taste good? Then I took it out of the oven to cool. It looked sooooo good, but would it taste good? We had dinner and as soon as it was over my daughter, who was spending the night that night, was on me to cut the pie. OK OK sheesh. Well I carefully took some pictures, then cut the pie and of course she had to wait while I took more pictures (the hazards of being part of a food bloggers family). Then I finally gave her the pie. I cut a piece for Kevin as well and held my breath as they took the first bite. Whew was I happy when they both looked at me with big smiles and said it tasted fantastic. My son and his girlfriend came over and they enjoyed it too!! I may have this pie baking thing down.....oops I had better not jinx myself!!! Place the blackberries in the pastry shell and set aside. Combine 1 cup sugar, flour, and salt. Add eggs and Greek yogurt, mix until blended. Pour the custard over the blackberries. In another bowl, combine white sugar, flour, and butter in a food processor. Pulse until mixture looks like sand. Sprinkle on top of the pie. Bake for 50 to 55 minutes, or until lightly browned. Cool on wire rack. I can't wait to try your recipe. Your pie looks so yummy! Visiting from DearCreatives.com come link up your recipes anytime if you like or just drop by. Happy Friday! "Make me" is right. I don't think I could have resisted the lure of this pie. Matter of fact, I'm not gonna. I'm hosting dinner tonight and happen to have some fresh blueberries on hand. This is going on the menu. Thanks so much for the delicious recipe! Oh I so hope everyone enjoyed the pie!!! 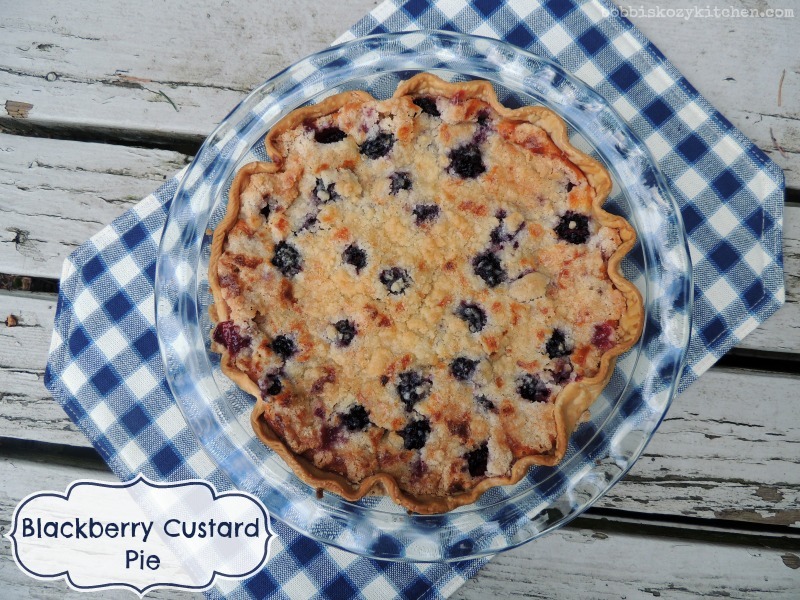 I'm always looking for a new recipe and this one for Blackberry custard pie is one to save and try for sure. Thank you for sharing with the Clever Chicks Blog Hop this week; I hope you’ll join us again!